On Friday night Geraldo Rivera and Bill O’Reilly went at it on The Factor over the notion that the “Fidel Castro”looking Geraldo accused O’Reilly of taking part in racist, demeaning and disrespectful interview of President Barack Obama in their pre-Super Bowl interview. Geraldo was more concerned that O’Reilly so-called stripped Obama “of his majesty.” HIS WHAT, ARE YOU KIDDING ME? This is what liberals think, that Barack Obama should have majesty. UNREAL. Obama is not a King, as much as he thinks he is. We found a Revolutionary War and a War for Independence in this country against the British Crown to get away from central leaders who thought they had majesty. Clueless and misinformed individuals like Geraldo are more concerned with Obama’s majesty than they are about a government of, by and for the people. This is exactly what is so totally wrong with our country today. Barack Obama works for us, “We the People,” and they are supposed to be responsible and accountable to us. It is the media’s job to question those in power, no matter what party is in office. However, Geraldo and fools of his ilk are more concerned that we coddle to Obama and any president who is destroying America. Geraldo Rivera was so out to lunch in this argument. The fact that all Geraldo go out of this interview was that O’Reilly called Obama a “community organizer” just shows the ridiculousness of liberals today looking for anything to attack those who would dare question Obama and any of his failed policies. Geraldo said during the segment that I don’t want to bring up race, which is code for, I am going to bring up race and use the race card. Personally, I could care less if one is black, brown, white, pink orange or blue … if Americans want their government to work for them and not be a Monarchy, then every single politician better be held accountable and have to answer OUR questions no matter how UNCOMFORTABLE they might feel. During an interview this morning on Fox & Friends – Weekend, Geraldo Rivera said that this is how politics tainted the legal process, raised expectations in the minority community and now has added to the racial divide when the verdict came back not guilty. 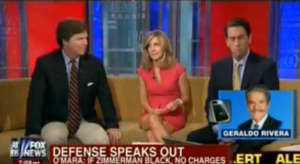 Defense attorney Mark O’Mara said that if George Zimmerman was black, he never would have been charged with a crime. Rivera went on to say that not all tragedies are crimes. The original prosecutors, the original police chief and officers did not believe a crime was committed. Rivera said that this was race politics, the president gave the signal and then Jesse Jackson and Al Sharpton stirred things up. Classic pic as Tucker gives Alisyn the are you friggin kidding me look as Rivera says he holds Sharpton & Jackson in high esteem. Might be worthy of a caption contest. Actually, it is completely irresponsible. Geraldo Rivera Says He is Considering a Senate Run in 2014 as a Republican? 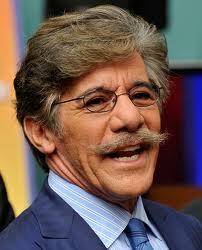 Fox News host Geraldo Rivera says that he is contemplating running for US Senate in New Jersey in 2014. Rivera would either be running against incumbent 89 year old Sen. Frank Lautenberg or Newark Mayor Cory Booker. However, Geraldo is no shoe in to be the GOP candidate for US Senate as there will be other challenges from GOP candidates like include state Assembly Minority Leader Jon Bramnick of Westfield, state Sen. Joe Kyrillos of Monmouth County and Lt. Gov. Kim Guadagno. Nothing has been finalized yet. If Geraldo does run for Senate he will have to give up his day job at Fox News. Geraldo Rivera, the host of a Fox News show, said Thursday that he is “seriously contemplating running” for the U.S. Senate in his home state of New Jersey. Rivera would be running for the seat that Sen. Frank Lautenberg, who is 89 and a Democrat, now occupies. Lautenberg is up for reelection in 2014 and has not confirmed whether he will run again. Rivera said he would run as a Republican. Newark Mayor Cory Booker, a Democrat, has made it known that he is considering running for the seat.